E.1900's. 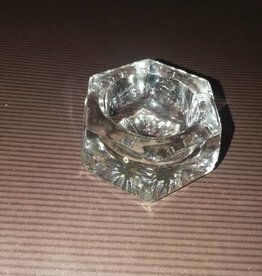 Cut glass candy/nut dish with finger hole handle. Excellent clarity & condition. 7" w/handle. 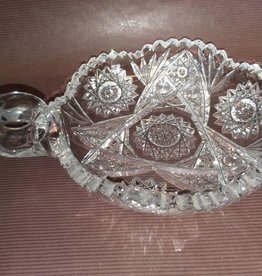 Cut Glass Nut Dish w/Finger Hole Handle e.1900's 7"
E.1900's. Cut Glass (clear) open salt. Starburst Bottom. 6 sided. Very nice condition & clarity. 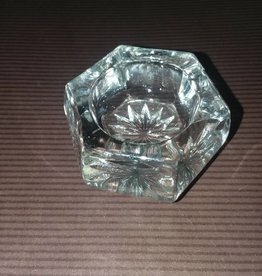 1.5"
Clear Cut Glass Open Salt, Starburst Bottom, E.1900's, 1.5"
E.1900's. Cut glass (clear) open salt. Floral etching on bottom . Very nice condition. 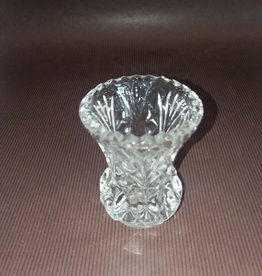 1.5"
Open Clear Cut Glass Salt Dish, Floral Etching, E.1900's, 1.5"
M.1900's. 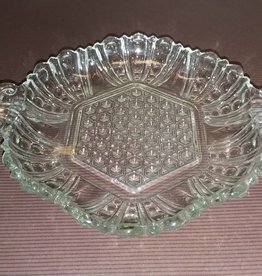 Cut glass candy or nut dish. Diamond design bottom. Excellent condition. Great clarity. No chips. 7.5"
E.1900's. 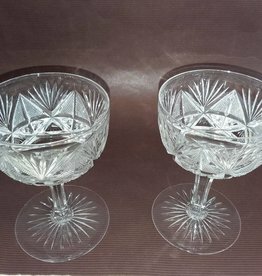 Pair of clear cut glass sherbets. Nice starburst design. There is a flea bite chip in the base of 1 of the dishes. Overall in very nice condition. 4.75" tall. Sold as pair only.